Terrorism can be defined as many things. There is no universally accepted definition but the Merriam-Webster dictionary defines it as “ the systematic use of terror especially as a means of coercion.” The U.S. Department of Homeland Security tells us that “Terrorism is the use of force or violence against persons or property in violation of the criminal laws of the United States for purposes of intimidation, coercion, or ransom.” But what is really known about terrorism? This special online edition will focus on terrorism, both international and domestic. It’s goal is to explain the inner workings of a few terrorist groups, thereby shedding light on the topic of terrorism itself. The 10 year anniversary of the September 11 bombings is fast approaching, but terrorism is still a huge concern, with numerous opinions on it. More recent than the 9/11 disaster were the Norway attacks. This showed many people that terrorism can happen anywhere, in any place, at any time. 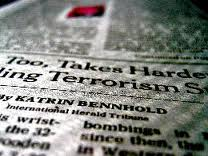 Although a lot has been done to combat terrorism, the war on terror is still being waged. The leader of one of the biggest terrorist groups has recently been brought down, but former-President Bill Clinton said the "battle to stop al-Qaeda and its syndicate of terror," is not over. Terrorism will continue to be met with the utmost resistance, and this special edition will try to bring it down in an unconventional way; with knowledge.